At St. Michael's we like to give our pupils the opportunity to take extra roles and responsibilities around school. 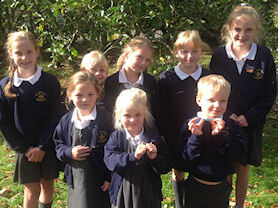 Our School Council consists of two representatives from each year group in the older year groups (one boy and one girl) and then one person from each of the younger classes, so that everyone has the opportunity to feed back ideas. We meet every half term to discuss issues that affect us in school and share ideas about things we want to change or improve in our school. We get involved in most decisions made in school. It is our school and we take responsibility for making sure that every child is heard. We even get involved in appointing new staff! The Eco team is made up of representatives from classes 2 to 4, staff and parents. 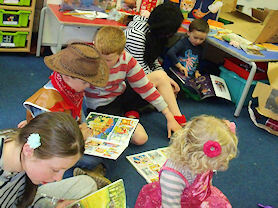 We meet half termly and often more frequently during the summer term. Apple juicing - with support from parents the whole school has been involved in picking, pressing and enjoying the fruit grown in the school orchard. Litter collection - to keep our school looking well cared for the team have taken part in litter picking activities during lunch break. Saving energy - taking part in a 'switch off' campaign to reduce the level of electricity used in the school. Gardening - with the help of parents we built a 'keyhole' garden which was inspired by meeting a Ugandan farmer from the Send a cow project. During the summer months we have planted and harvested a range of vegetables. Assemblies - visitors have led assemblies on litter and caring for our local area as well as how to reduce the energy we use in our school and homes. Each year we pair up our new Reception children with a special friend from Year 6, at the very start of the Autumn Term. This is a very effective and long-lasting way of creating bonds between the very youngest and very oldest children in our school. It is one of the special jobs that the Year 6 children really look forward to in their final year. It helps them to develop their sense of responsibility and is so useful for our new children to have a person who is watching out for them in particular around the school. 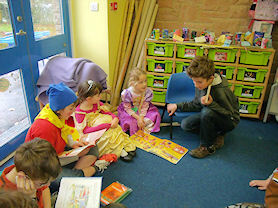 Reception and Year 6 sharing stories on World Book Day.